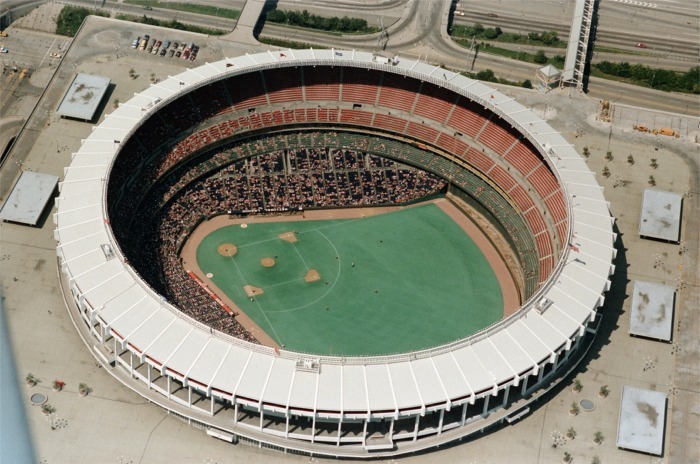 For many in baseball, Riverfront Stadium was just another cookie cutter baseball stadium. 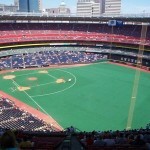 For fans in Cincinnati it was a place where they could come to see the Reds play each summer. 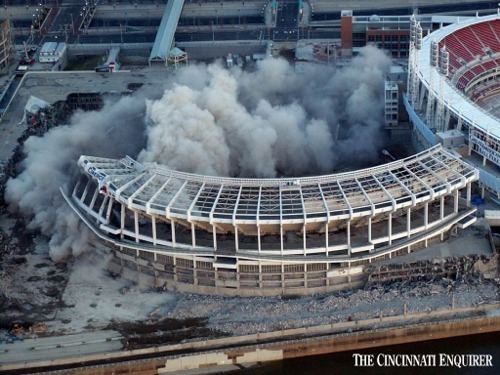 It was the home to many great players and some of the best teams in in baseball during the 1970s with the Big Red Machine. 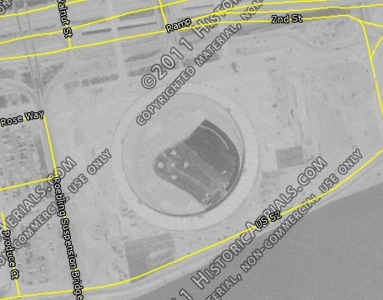 As early as the 1940s discussion for a new stadium for the Reds was discussed. 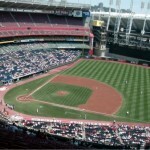 Talks did not intensify until the 1960s when owner Bill Dewitt wanted a new stadium built in the Blue Ash area of Cincinnati. 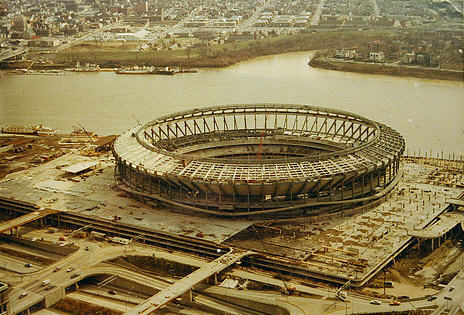 He wanted a dome stadium built here but the city wanted a new stadium built downtown along the riverfront. 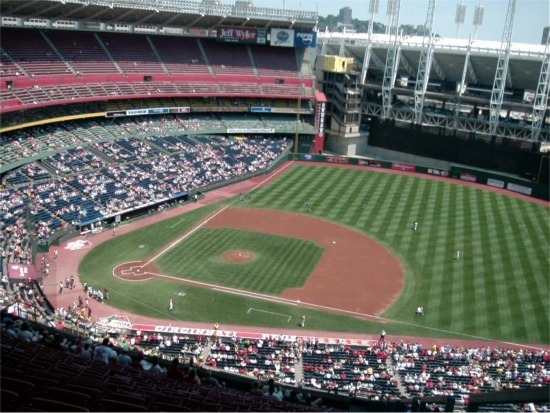 Crosley Field was no longer a viable option because of its age, it was land-locked by Interstate 75 and the neighborhood was blighted by the 1960s. For a time there was talk that Dewitt may move the team to San Diego. 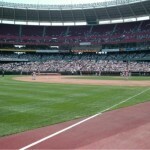 However he sold the team to local investors in 1966 ensuring that the Reds would stay in Cincinnati. 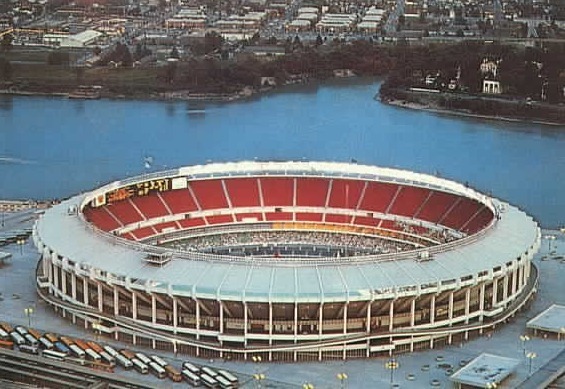 After the American Football League awarded Cincinnati a franchise, the Cincinnati Bengals, a new stadium on the Ohio River was built. 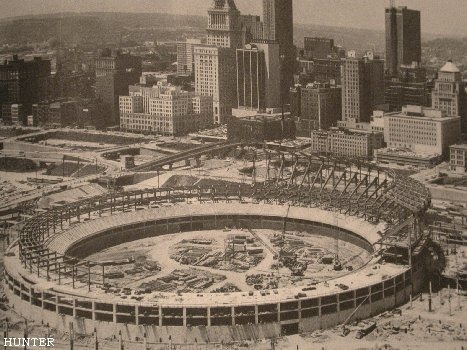 Named after its location, groundbreaking for Riverfront Stadium occurred on February 1, 1968. 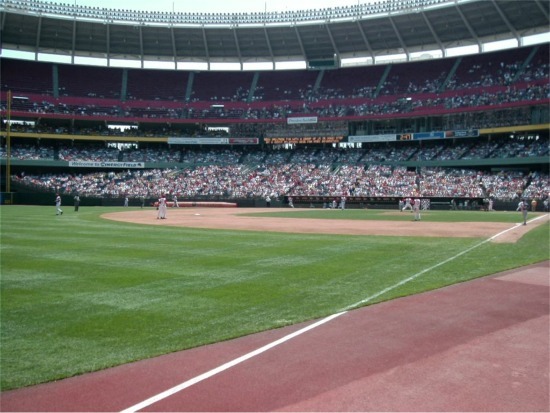 After over two years of construction, the Reds played their first game at Riverfront Stadium on June 30, 1970 against the Atlanta Braves. Hall of Famer second basemen Joe Morgan wins MVP in 1975 and 1976. 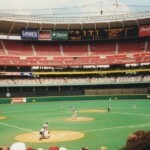 Pete Rose’s 4,192 hit on September 11, 1985. 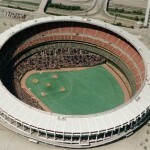 Home of the Big Red Machine of the 1970s. 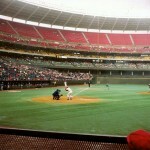 Catcher Johnny Bench wins MVP in 1970 and 1972. 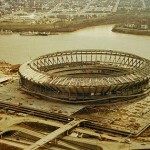 Riverfront Stadium was similar to every other multipurpose, cookie-cutter stadium built in the late 1960s and early 1970s. 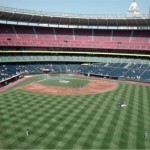 It had a capacity of 52,952 for baseball and 59,754 for football on four levels. 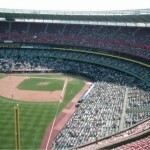 The lower (blue) level seats stretched from the left field foul pole to homeplate around to the right field foul pole. The other three levels green, yellow and red circled the playing field. 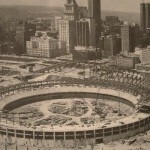 A three level parking garage accommodating 2,500 cars encased the stadium with the entry gates to the stadium on the second (green) level. 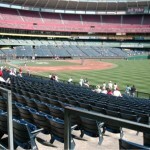 Fans had to walk down ramps to get to the field (blue) level of seats. 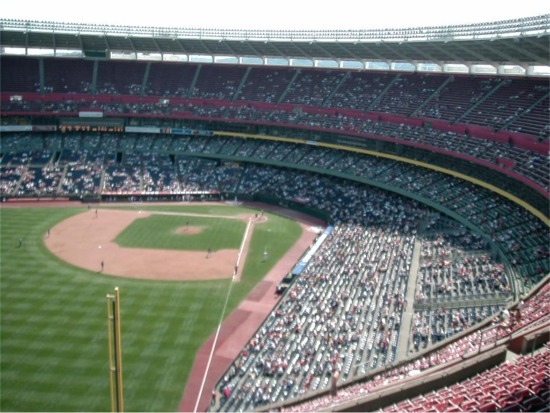 The scoreboard was located above the centerfield seats in the upper deck. 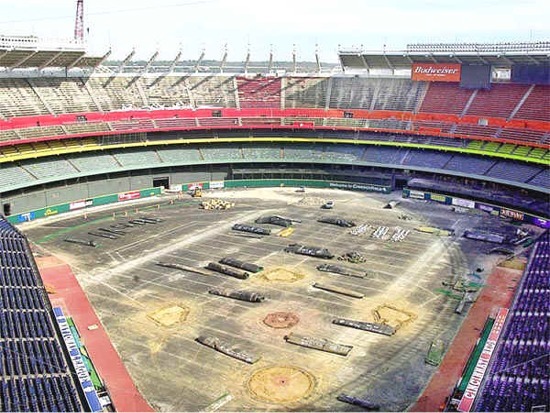 In order for the stadium to be converted to football, the lower field box seats for baseball from home plate to the left field foul line were moved on wheels so the field could be converted to a football gridiron. 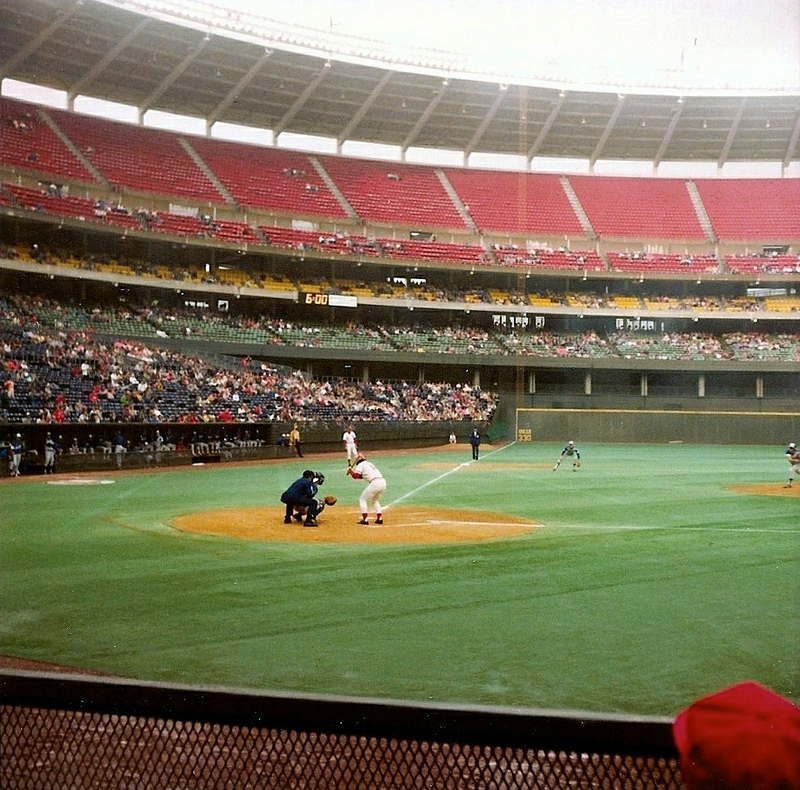 Few changes occurred at Riverfront Stadium during its first 25 years. In 1996 the naming rights were sold to Cinergy Corporation and Riverfront Stadium was renamed Cinergy Field. 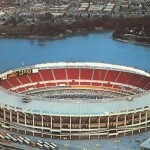 During this time both the Reds and Bengals sought to have new, separate stadiums built. 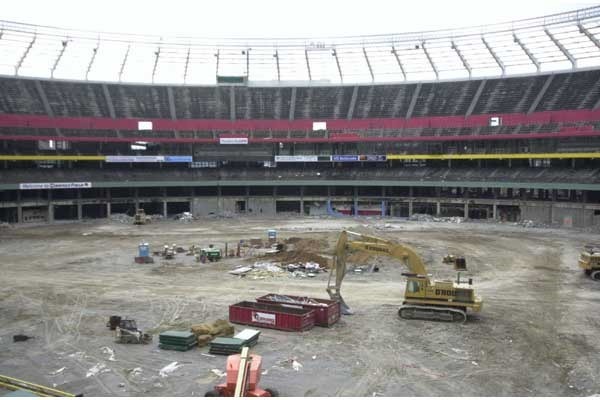 The Bengals moved out of Cinergy Field and into Paul Brown Stadium in 2000. In 1998, the Reds announced that a new ballpark would be built next to Cinergy Field. 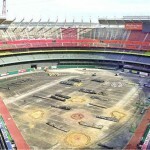 In order for construction to begin, approximately 14,000 seats from the outfield were removed after the 2000 season. 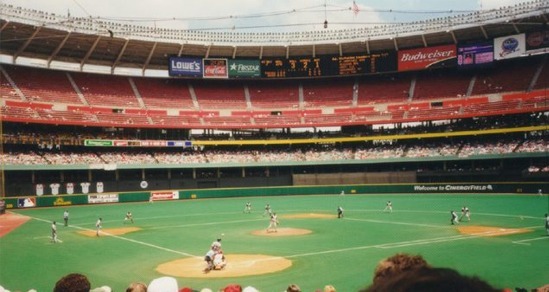 The bullpens were relocated behind the right field wall. 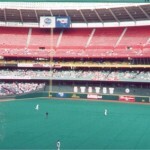 With the removal of 14,000 seats the Reds installed natural grass, replacing the Astroturf. 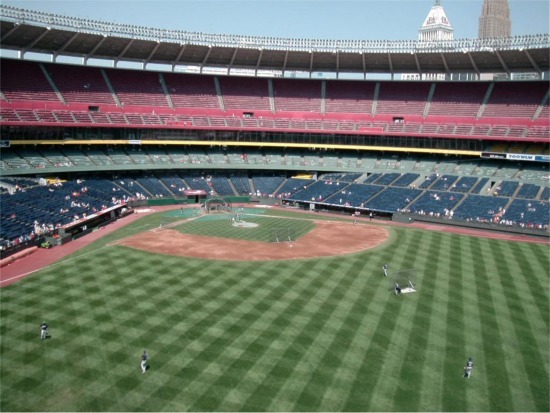 For two seasons Cinergy Field looked like an actual ballpark. 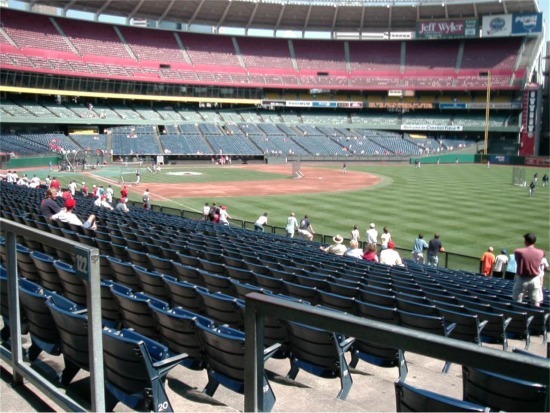 During the 2001 and 2002 seasons fans attending games at Cinergy Field no longer had to stare at empty seats beyond the outfield fence. 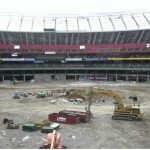 Instead they could see the Ohio River and the Reds new ballpark, Great American Ball Park being constructed. 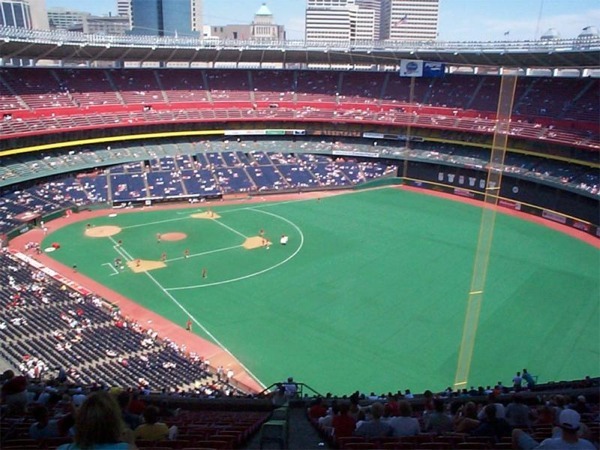 The Reds played their final game at Cinergy Field/Riverfront Stadium on September 22, 2002. 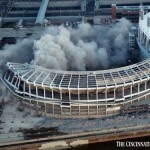 The stadium was demolished on December 29, 2002 and part of the site is now part of Great American Ball Park.